It's that time again. 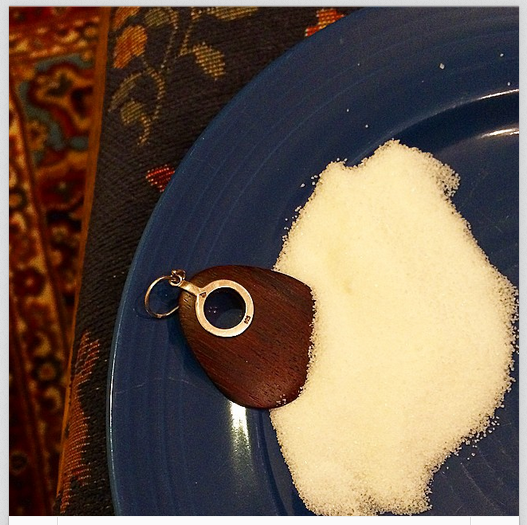 Today we have a small wooden object and some sugar. It's intense. I wear this wooden earring all the time. I wore it yesterday, in fact. It's the mark of a sisterhood. At my last job, I was one of a few "Sister Wives," some close colleagues who had each other's backs. Like the ladies in Big Love, we didn't rely on outside forces to determine our bond. Unlike the ladies in Big Love, we didn't share a husband. Obvi. But in any case, these women are stellar, and once we bought matching earrings as a symbol of our work together. This wooden object is one of those earrings. I love the story behind your wooden object. I bought a pair of earrings when we were in Chicago with LH for NCTE or NCTEAR. They make me think of the two of you. Just thought I'd share that.